Sen. Bernie Sanders (I-Vt.) has drawn rock-star-size crowds to arenas around the country. He's raised a whopping $40 million, largely from small-dollar donors. He's passed former secretary of state Hillary Clinton in polls of New Hampshire voters, pulled her to the left on several key issues, and he held his own in last week's debate. And, with a little help from comedian Larry David on "Saturday Night Live," he's even begun to break through as an improbable pop culture icon. Now, all the septuagenarian socialist has to do is convince the American electorate that he can really serve as the nation's 45th president. No big deal. With that in mind, says senior adviser Tad Devine, the Sanders campaign is entering a new "persuasion phase," during which it hopes "to find more opportunities to get closer to voters" and convert excitement into commitment. "We're out of the summer. We're into the fall/winter phase of the campaign," Devine says. "We really have to get beyond finding people who are [already] supportive of Bernie. We really have to move into groups of voters who are uncommitted — who are softly supporting him and other candidates." To that end, Sanders began scaling back the size of his public events last weekend during a trip to Iowa — trading massive barn-Bern-ers for more intimate house parties. 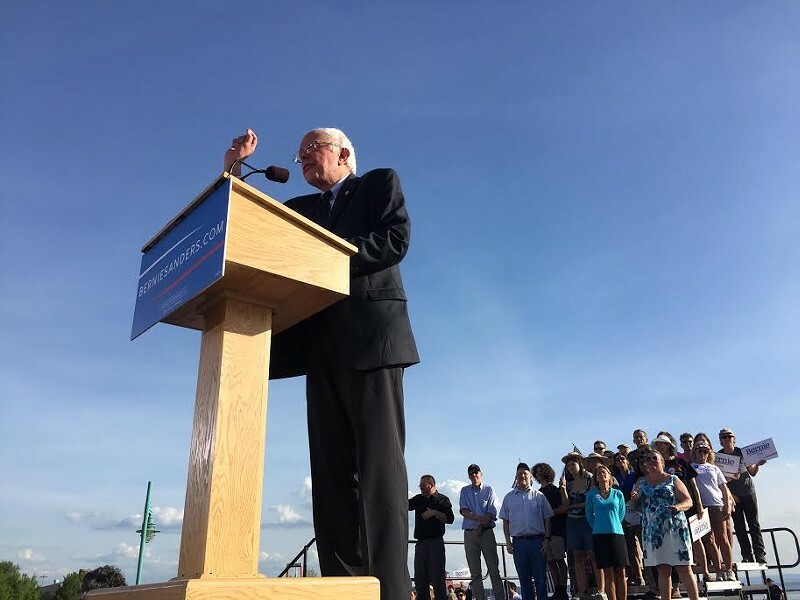 "We're going to continue to do very large rallies," Sanders told reporters after one such gathering Saturday. "But also small events, like this, where a few hundred people come out, where you can have the opportunity to answer questions and chat." That's important, says University of New Hampshire political scientist Dante Scala, because while a "Sanders stem-winder" may "affirm the faithful," it "may not persuade the persuadables." The question his advisers should be asking, Scala says is, "How do you transition from being a protest candidate, a message candidate, an advocacy candidate, to someone who's a plausible presidential nominee?" That's a question Brattleboro resident Kate O'Connor faced when she helped run former governor Howard Dean's 2004 presidential campaign. "We said, 'Let's do smaller events where we're just talking to Iowa voters, reminding them why Howard is great and why they should vote,'" she recalls. But O'Connor concedes that the Dean campaign made the move too late — something Sanders is hoping to avoid. Having squirreled away more than $27 million by the end of September, the campaign is preparing to air its first television ads next month, Devine says. They'll be playing catch-up with Clinton, who aired her first ads in Iowa and New Hampshire in August. "There's been a lot of voter contact on their end in that persuasive media," the strategist says of the tube. "We felt we didn't really have the resources to do it for all those many months." The campaign has also begun polling, Devine says — not to test its message, but to figure out where it can most efficiently spend advertising dollars. Sanders has been courting new audiences in recent weeks — dancing on "Ellen" and appearing on PBS' "Tavis Smiley." He's even learned how to laugh — joking with reporters on Sunday about David's SNL appearance and how many pairs of underwear he owns, instead of castigating the press for treating politics as entertainment. In the coming months, according to Devine, Sanders will deliver a series of "set-piece" speeches focusing on tax policy, foreign policy and what it means to be a "democratic socialist." "I think we have some explaining and work to do," Sanders said Sunday in Iowa. "Because I think there are people who, when they hear the word 'socialist,' get very, very nervous." Lest Sanders supporters worry that their candidate will shape-shift into a conventional one, Devine assures that is not the case. "We're just gonna get bigger," he says. "There's not going to be a change in message. There's not a big change in tactics. The big things for us will be that we're growing." Sanders isn't the only Vermont senator jetting around the country to drum up support for his candidacy. During last week's congressional recess, Sen. Patrick Leahy (D-Vt.) flew to Denver and Chicago to raise money for his 2016 reelection campaign, according to campaign manager Carolyn Dwyer. So who hosted the fundraisers, attended them and paid for his travel? Dwyer won't say, noting that some of that information will become public when Leahy files his next disclosure at the end of the year. Vermont's 41-year senator has been mighty busy collecting campaign cash in recent weeks. Last month, according to invitations obtained by the Sunlight Foundation, the Entertainment Software Association and the lobbying firm Van Scoyoc Associates hosted fundraisers for Leahy in Washington, D.C. As Seven Days reported two weeks ago, the senator threw his own lobbyist fundraiser in Vermont earlier this month. And in November, he's charging $2,000 a ticket for donors to accompany him to a Dead & Company concert in D.C., featuring John Mayer and three of the Grateful Dead's four surviving members. Talk about a "Shakedown Street." In last week's Seven Days, embattled Sen. Norm McAllister (R-Franklin) defended himself against charges that he sexually assaulted two women and attempted to coerce a third. He told staff writer Mark Davis that he would not resign his Senate seat, nor plead guilty to the three felony or three misdemeanor charges he faces, because, he said, "I didn't do anything wrong." That prompted Sen. Joe Benning (R-Caledonia) to fire off a letter to McAllister on Friday reminding him that he'd promised to resign by November if his case was still pending. "It is therefore with some dismay that I am reading news reports quoting you as determined to go to trial and refusing to resign," Benning wrote, adding that McAllister's return in January would be "extraordinarily uncomfortable for every individual in the building, including you" and would leave the Senate "in complete disarray." The Caledonia Republican said he would file a resolution calling for his colleague's expulsion if he did not hear back by November 1. Helpfully, he even included a draft resignation letter for McAllister to sign. Benning, who serves as minority leader, emailed copies of the letters to the rest of his nine-member caucus and Lt. Gov. Phil Scott, saying he would not file the resolution on behalf of Senate Republicans unless they wanted him to do so. Sen. Peg Flory (R-Rutland) certainly does not. She responded to her colleagues by email, saying that she "strongly disagree[d] with bringing a resolution for expulsion." Flory said that McAllister should be afforded the presumption of innocence and should come to his own conclusion about whether to resign. "For just one second, let us assume that Norm is innocent and this is a setup," she wrote. "Wouldn't this set a dangerous precedent? All someone would have to do to remove an elected official would be to make damning, spurious allegations, particularly of a sexual nature." Benning and Flory continued to debate the matter over email until Sen. Dustin Degree (R-Franklin) suggested that "this is a conversation best had in person — or over the phone." Read Benning’s and Flory’s entire correspondence. At the end of every email it sends, Emerge Vermont claims it "does not endorse candidates." But the group, which is dedicated to training Democratic women to run for office, appears awfully interested in the fate of gubernatorial candidate Sue Minter, a member of its advisory council, and lieutenant gubernatorial candidate Rep. Kesha Ram (D-Burlington), a member of its board of directors. In an email to its membership sent last Friday, the organization promoted appearances by Minter and Ram at its annual fundraiser Monday at the Shelburne Museum. Who clicked "send" on the email? Outgoing Emerge Vermont executive director Sarah McCall, who was hired five weeks ago to run Minter's campaign. McCall says she's simultaneously working "more than full time" for Minter and "no more than 20 hours" a week for Emerge — at least until the latter organization can hire a replacement. McCall defends the email, saying it was in no way an endorsement of Minter or Ram. "We are very cautious not to encourage our network to support one candidate or another or vote for a particular candidate," she says. But Emerge often comes pretty close. Just before March's Town Meeting Day elections and last November's general election, the organization emailed its list to "recognize" — and explicitly name — graduates of its training program who were on the ballot. As a 527 nonprofit political organization, Emerge is barred from explicitly advocating the election of federal candidates. Under Vermont law, such a group must register as a political action committee if it raises and spends at least $1,000 supporting a candidate or seeking to influence an election — and then file regular disclosure forms. Emerge has not registered as a PAC. According to Secretary of State Jim Condos, it may be in the clear. "I think at this point it's still gray," he says. "The email doesn't say 'support.' It just says these two candidates will be there." Right. Nothing to see here! The Burlington Free Press announced late Friday that two pillars of its newsroom — executive editor Mike Townsend and reporter Mike Donoghue — have accepted corporate buyouts and will retire by the end of October. Three other longtime employees — Skip Bennett, Annette Letourneau and Tom Powers, who worked a collective 103 years for the paper — also took the deal. According to a newsroom memo obtained in August by media blogger Jim Romenesko, Freeps owner Gannett Company, Inc. offered up to a year's pay to employees age 55 and older who'd spent at least 15 years with the company. The departure of the Mikes extends a period of turbulence at the Freeps, which has been plagued by layoffs, buyouts and voluntary exits. According to staff lists posted on its website, 19 of the 31 editorial employees who worked for the paper three years ago have since left. Among them: John Briggs, Sam Hemingway, Tim Johnson, Lynn Monty, Candace Page, Matt Ryan, Matt Sutkoski, Terri Hallenbeck, Nancy Remsen and Molly Walsh. The last three now work for Seven Days. Some of those positions have been filled by younger, less experienced reporters; others have been eliminated. A current staff list indicates that 21 people, including the Mikes, remain in the editorial department. Publisher Al Getler told Seven Days last week the Freeps plans to fill all five positions vacated by the buyouts. "I'm extremely upbeat about where we're going," he said. The Free Press isn't the only paper in town losing talent. After seven years at Seven Days, senior food writer Alice Levitt is leaving the paper early next month to become dining editor at Houstonia, a monthly mag out of the Lone Star State. According to publisher and coeditor Paula Routly, Seven Days is already on the hunt for a replacement — "though Alice is so unusual, that hardly seems like the right word," she says. "This summer marked half my lifetime spent in Vermont. It feels like time to grow and to get to know a new dining scene," Levitt says. "I'll miss the comfort of my adopted home state, but won't miss the lack of good Korean food and cheap tacos." We'll miss you, too, Alice. Please send tacos. Listen to Paul Wednesdays at 8:10 a.m. on WVMT 620 AM.